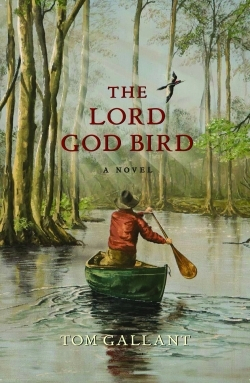 The Lord God Bird is a quiet novel with a solitary spirit. Like its protagonist, it delves into the muddiness of the human condition—the way we live and lose our lives—but does so with gentle strokes of methodical, tender revelation. In the deep woods of Arkansas, a lonesome widower paddles through still waters and breathes in his surroundings in meditative peace. He is part of the woods, rooted by history and habit to natural surroundings that provide him with an abiding connection to the real substance of life. In one brief, fleeting moment he catches a glimpse of the Ivory Billed Woodpecker, a magnificent bird believed to be extinct from the area. The sighting is a long-awaited omen of good things to come for the widower and the town in which he lives. The town, nearly empty and slowly succumbing to the economic invasion of large conglomerates, is in need of a revival; the widower, still grieving, is in need of hope. This novel engages itself in an interesting experiment involving perspective. The narrative features dual voices—the lonesome widower as he copes quietly with the death of his wife, and the perspective of the Ivory Billed Woodpecker as he warily nests with his family in the Big Woods, the land of his ancestors. At first, the choice to create a bird’s perspective seems odd and ill conceived. However, Gallant’s rendering of a bird’s memory and thought process is captivating and, as the story progresses, the bird as character becomes a necessary and welcome aspect of the novel. The prose is sparse, creating a crisp narrative landscape where nothing unnecessary is brought to the page. The opening words of the book evoke this sense of simplicity and set the tone for the rest of the novel: “The man lived beside the river at the edge of Big Woods, Arkansas. The big woods were no longer big.” The writing is disciplined and restrained, but has a melodic gait, the narrative rhythmic and calming. This unadorned style allows the characters to breathe, with the world behind the words presenting itself as sumptuous and riveting, even as the prose that depicts it does so in the simplest form. This sparse style and structure of the novel also serve as an archetype for the messages the novel aims to espouse: To live simply; to thrive on necessities instead of excess; and to rejoice in nature, relationships, life, and death—these lessons are embodied in the lives of the characters. This minimalist approach creates a seamless text where form reflects content quite beautifully. The Lord God Bird is a book with diverse appeal. In an era punctuated with all levels of neglect, it provides a voice of gentle reason.